The Country Park is set within two distinct areas - the Brushes Valley in Millbrook and smaller sites at Carrbrook, which are linked by footpaths, tracks and bridleways. Ponds and small pockets of woodland can be found at the foot of Brushes Valley. Higher up, the valley floor is dominated by four reservoirs, which lead on to open heather moorland. Old industrial sites reclaimed by nature can be found at Carrbrook. Wooded riversides and wetlands can be found here along with a further reservoir. The Country Park is ideal for walking, horse riding and cycling. For the less energetic, there are plenty of picnic areas to choose from. On a clear day it is worth hiking to the top of Wild Bank, where the views are breathtaking. The Ranger Service runs a variety of events throughout the year. These range from children's activities to strenuous moorland rambles. Download a copy of the wayfaring trail (0.56MB) especially designed for children. Woodland birds and hawks hovering over the moors can easily be spotted. You could be lucky enough to see rabbits and weasels and even blue mountain hares which turn white in winter. Ducks, herons, frogs and toads are also regular visitors to the many ponds and wetland areas. A variety of footpaths, tracks and bridleways within the Country Park means you can make routes as short or long as you like. Flatter routes can be found in the lower part of the Brushes Valley and around Carrbrook, some being suitable for wheelchairs and prams. More demanding routes can be found further up the valley. Many of these lead on to other areas of open countryside. On the whole the Brushes Valley and Carrbrook are served by well surfaced paths. Wilder areas of the Country Park can, however, only be reached by rugged and sometimes muddy paths, but the scenery makes it well worth the effort. Running through the top of the Brushes Valley is the Tameside Trail, a 40 mile walker's route which follows the borough boundary. 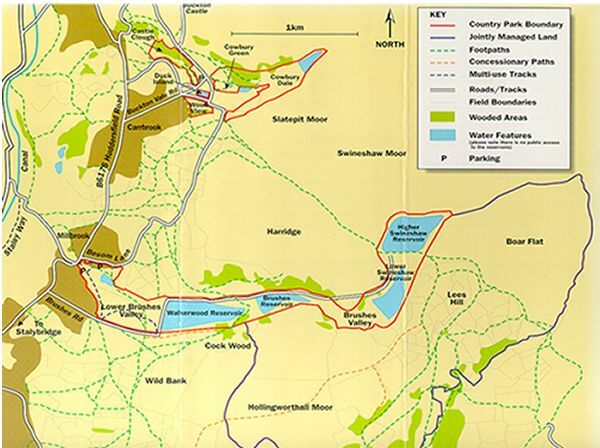 The Pennine Bridleway National Trail will also pass through the Country Park. Stalybridge Country Park is one of the number of countryside areas in Tameside you can enjoy. Other areas you may find interesting include Werneth Low Country Park, Park Bridge, Lymefield and Broad Mills. The Country Park is managed by Tameside Council's Countryside Service. Our role is to conserve wildlife and landscape quality and maintain public access. An educational service is available for schools and other groups. Millbrook lies about a mile and a half to the north-east of Stalybridge. Millbrook and Carrbrook are both located along the B6175 Huddersfield Road. The nearest stop by train is Stalybridge. Regular bus services run from Stalybridge to Millbrook and Carrbrook For those wishing to walk or cycle from Stalybridge the Staly Way multi-use track is an excellent way to reach Millbrook. The Country Park is here for all to enjoy. Please respect other park users. Keep your dogs under control. Horse riders please do not gallop, remember that walkers share the bridleways. Cyclists should give way to horse riders and walkers. Motorised vehicles are not allowed in the Country Park except in the car parks. Some parts of the Country Park are quite remote. Make sure you know where you are going and stay on the paths. Remember that the weather can change quickly, even in the summer, so be prepared. Much of the moorland which surrounds Stalybridge Country Park is privately owned and access is currently restricted to the footpaths only. This is a very delicate habitat and is carefully managed. Please do not disturb the wildlife by straying from the paths or by letting your dogs roam freely (keep them on a lead). Many areas of the Park are suitable for people with limited mobility or other special needs. Separate information is available. If you are making a special visit and would like to check suitability, please contact us at the above address, telephone number or e-mail address. Find leaflets containing information about the history of the parks in Tameside as well as all the information and maps about the many walking areas.